This picture was taken in front of the George Bush Library. Please if you know them (father and son) would you point out there would be no sunset, no tree and no me if there were no ecosystem. 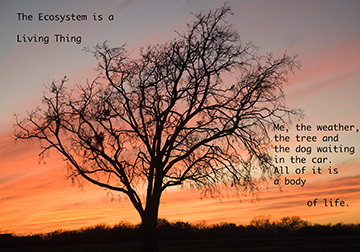 We already discussed that the ecosystem is a living thing, but this slide is a little reminder before we get to slide 6 that lists the three most basic requirements for the ecosystem to stay alive. The most basic living thing on earth is the cell; the largest living thing on earth is the whole earth ecosystem. All living things on earth are made of cells; the whole earth ecosystem consists of all the living things on earth.